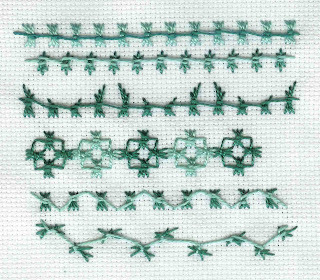 I'm slowly working through the TAST samples and here's my go at Butterfly chain stitch. When I looked at the samples done by Sharon at http://www.inaminuteago.com and by Elizabeth at Quieter Moments I was quite enthused and thought I would really enjoy this stitch. But somehow my efforts were just disappointing and I don't really like the look of any of them. Maybe it's the green thread to blame - not my favourite colour but I went with the first one to hand in the box. Never mind it was still good to try and maybe I'll enjoy the next one more. Looks good to me Lynne. Lynne, I really like this sampler and I see a lot of potential in it, too. It's very inspiring to me. For instance, that third band makes me want to dig out my needle and thread and play around some more with this stitch. You've got a nice curve going between the points along the top. Your fourth band made me see a pattern that I didn't try that week we were on the butterfly stitch. You've done a lot of great work with the TaST stitches. And I loved your collection of windows. I should have been leaving a lot of comments along the way here because I also enjoyed the work you did with the gingko. I live in and area where there are so many, that I count on a golden autumn! Thanks both for the encouragement especially as last night I was having a go at crossed buttonhole and had to unpick 2 rows - I was so absorbed in getting the pattern right that I was missing the twisted bit at the bottom that makes it butttonhole rather than a sort of cross stitch. Ah well, I'll have another go this evening!